The basic set-up required for close-up photography apart from the obvious camera body is a lens with macro capabilities. These macro-capable lenses can come in the form of a (short/long) tele-photo lens with a close-up "filter", a standard zoom lens with macro mode settings or a specialized Micro Nikkor macro lens. For high magnification macro photography, the type of camera bodies used can make a very big difference in the sharpness of the image. The reason for this difference is the vibrations caused by the internal reflex mirror as it lifts out of the way when the shutter release is triggered. This is commonly known as mirror-slap vibration. It becomes a real issue when you combine high magnifications with slow shutter speeds, which is invariably the case in high magnification macro photography. There are a series of Nikon SLR bodies, like the F2, F3, F4 & F5 bodies, that have mirror lock-up (MLU) function, physically locking the mirror away to avoid this problem. The Nikon digital SLR D1, D1X, D1H & D100 bodies, overcome this problem with the “Mirror Anti-Shock” command menu setting which lifts the mirror a few fractions of a second in advance before tripping the shutter curtains. For all other Nikon bodies without MLU, it is best to use the self-timer function as the reflex mirror is normally lifted slightly more in advance (some longer than others) prior to the activation of the shutter curtains. For users of digital compacts with macro capabilities, like the Coolpix, you simply turn-on the camera’s macro function to allow the camera to focus at very close distances. Other accessories described later are mainly used in conjunction with SLR or DSLR camera bodies but Coolpix users might still find these sections relevant, especially the tripod and cable release section. In the following sections, the various types of lenses and accessories that can be utilized for close-up and macro photography will be introduced and briefly discussed. There are two basic types of lenses that can be used directly (i.e. without any additional attachments) for macro photography. The first type is the standard zoom lens with “macro mode” capabilities that will only engage at a pre-set focal length -normally at the longest focal length of the zoom lens. These provide limited macro capabilities, allowing up to approximately 1:3 magnification ratios. The second and most preferred type is the specially designed macro lens, the Micro-Nikkor lens as termed by Nikon. 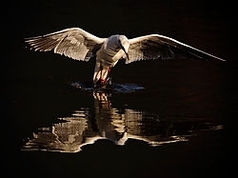 The first is simply to use it as one would with any other lens, which is to compose the picture by moving in close until the desired composition is achieved and focusing on the intended subject(s). This is about the most common method used by many and is well suited for general close-up photography where the actual magnification size is not important. The second method is a more precise procedure, where the actual intended magnification (e.g. 1:2 or half life-size) is pre-set on the lens and focusing is achieved by moving the entire camera AND lens set-up backwards or forward… without touching the focusing ring on the lens anymore. This method normally requires the use of a sturdy tripod and a cable release. 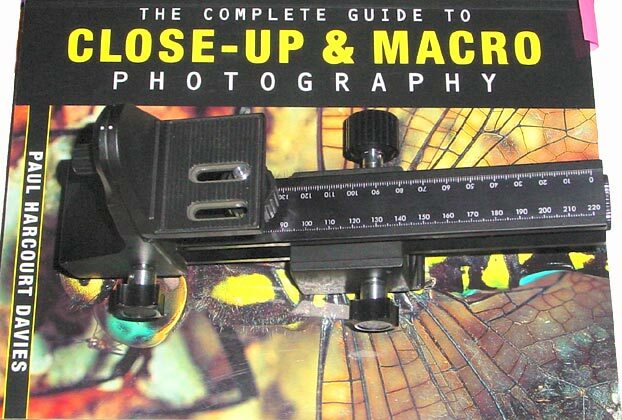 Another very useful, although optional, accessory for this second method of close-up photography is the focusing stage which allows the entire system to be mounted on a rail for very precise camera/lens positioning. To set or read the magnification ratio when using specific macro lenses such as the Micro-Nikkors, the most important scale to pay attention to will be the magnification scale. 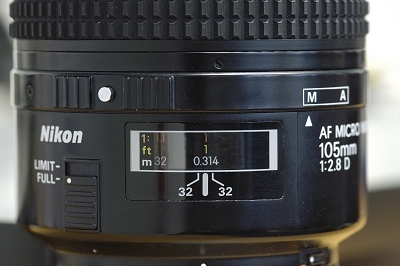 Taking the AF 105mm f/2.8D Micro-Nikkor lens as a working example, the magnification scale is located on the top line of the scales window printed in orange. As explained in the introduction, the scales are defined in the format of the image-on-film size X to the actual subject size Y and is represented in the form of X : Y. 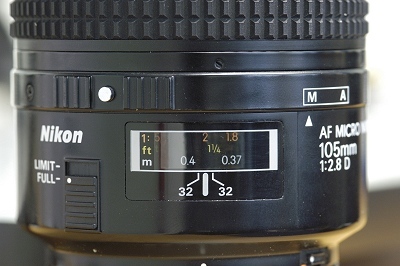 The X value is the permanently printed “1:” value on the left of the window, while the Y value is the adjustable value ranging from 10 down to 1 on the rotating lens barrel. In the sample images above, the left one shows a setting of 1:10 magnification ratio (1/10th reproduction), the center one shows a setting of 1:2 magnification ratio (half life-size reproduction) and the image at right shows a setting of 1:1 magnification (actual life-size reproduction). If you are thinking about trying out macro photography for the very first time, I would strongly advise to start by using existing equipment, especially if lenses with some macro capabilities are already in your inventory, and move on to possibly getting one of the close-up attachment lenses. In some cases you will be able to achieve up to full 1:1 life-size capabilities straight away with just one close-up lens attachment. These close-up attachment lenses work in the principle of placing a magnifying lens element in front of the camera lens to increase the size of the image projection. If a higher level of magnification is required, a second or third close-up lens attachment can be stacked one on top of the other. This is about the least expensive option to get your feet wet in macro photography and should you decide that close-up work is not quite your cup of tea, this initial outlay would be much more bearable compared to spending hundreds of dollars on specialized lenses. There will however be an obvious compromise in the image quality if you compare this sort of a set-up with a true macro lens. There are a total of 7 different close-up attachment lenses from Nikon. These are the No. 0, No. 1, No. 2, 3T, 4T, 5T and 6T close-up attachments. They have different magnification values (also known as "diopters") and fit two different thread sizes, namely the 52mm (No. 0, No. 1, No. 2, 3T & 4T) and 62mm (5T & 6T) sizes. If all you have are standard and wide-angle lenses, another method of obtaining high magnifications is to reverse-mount them. The BR-2A Lens Reversing Ring allows any 52mm front thread size lens to be reverse-mounted onto a Nikon body (or bellows). For lenses with a 62mm front thread size, the BR-5 (62mm to 52mm internal thread step-down) adaptor can be attached between the front of the lens and the BR-2A lens reversing ring. At right, Reverse-mounted 28mm lens (52mm thread-size) using the BR2A. Note that the other version of the Lens Reversing Ring, the BR-2, can only be used with the manual bodies that DO NOT HAVE the electronic contacts found on the old and new AF bodies (excluding the F3AF). The BR-2A adaptor has been designed specifically for AF bodies, while still compatible with the older MF bodies, by ensuring that the lens' electronic contacts do not come into contact with the adaptor when it is mounted onto the camera body. At right, a reverse-mounted 20mm lens (62mm thread-size) using the BR2a & BR-5. Extension tubes are another set of attachments that are often used in achieving larger than the normal lens magnification for macro photography. The extension tubes are mounted between the lens and the camera body. These extend the distance between the lens and the film plane on the camera, increasing the magnification of the subject on that film plane. It is a similar concept to moving a slide projector further away from the white screen to increase the size of the projection. However, in the case of the camera and lens extension the film size is of a fixed dimension, so the further away the lens is from the film plane, it is effectively cropping more off the borders of the original image projection through the lens. These extension tubes should not be confused with tele-converters. The extension tubes are simply hollow tubes at specific lengths to allow precise steps in lens to camera extension, while the tele-converters have a magnifying lens element in them that increases the focal length of the lenses by the specified multiplier (1.4x, 2x, 3x, etc…). The current Nikon series of extension tubes consist of a set of three: an 8mm PK-11a, a 12.5mm PK-12 and a 27.5mm PK-13* extension tube, plus the PN-11* extension tube. As with the lens reversal adaptor, the PK-11 extension tube is meant for manual bodies while the PK-11a extension tube must be used for all AF bodies with electrical/electronic contacts in the lens mounts. *Note: The PK-13 is the standard extension tube for the manual focus 55mm AI-S Micro-Nikkor and the PN-11 is the standard extension tube for the manual focus 105mm AI-S Micro-Nikkor to achieve their full 1:1 life-size capability. 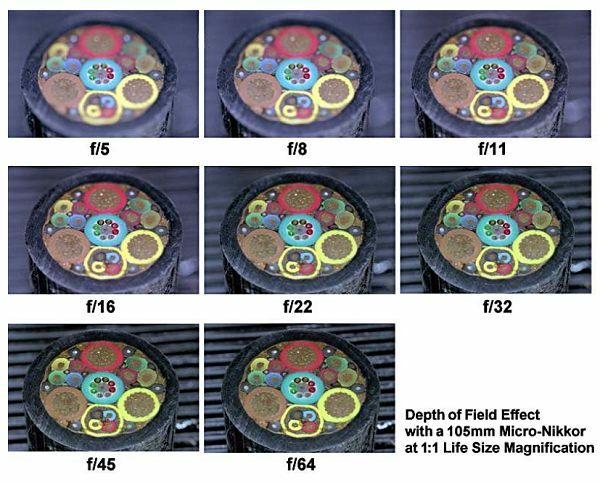 On their own, the 55mm and 105mm Micro-Nikkors will only reach a maximum of 1:2, half life-size magnification. One useful and sometimes essential accessory for macro work is the focusing stage. 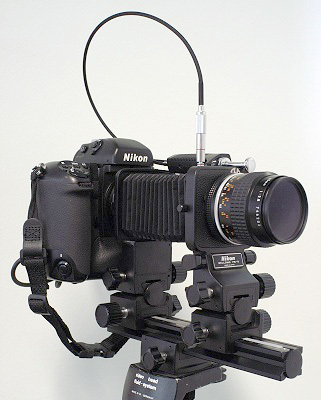 This focusing stage comprises of a standard camera mounting unit that sits on a set of rails, allowing the entire camera and lens set-up to be moved forward or backwards while mounted on a fixed-position tripod. The advantage of using a focusing stage is to eliminate the need of shuffling the tripod and losing the subject or composition while trying to get into that optimum position. 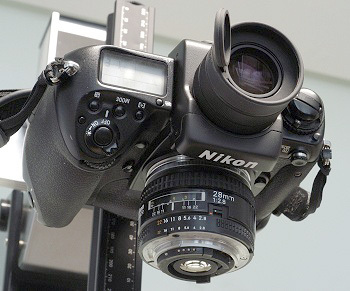 The Nikon focusing stage, the PG-2, allows the normally mounted camera body to be rotated 90 degrees for a horizontal format shot. Other third-party models may also allow the body to transverse left or right via various mechanisms such as a worm & worm wheel system. Another form of a focusing stage is the Copy Stand. This is pretty much the foundation base you find on some enlargers; essentially it consists of a sturdy rail system mounted vertically on to an 18% Grey base, like the Nikon FP-4. Most copy stands would also include a set of lamps for general illumination, ideally fitted with proper daylight-balanced light bulbs! For very large lens-from-camera extensions, rather than using multiple extension tubes which can be difficult to support, bellows extensions are used. The principle of the bellows works exactly the same as the extension tubes. The difference here is that you can achieve a much larger extension without fear of bending the tubes or causing damage to the camera mounts due to the over-hanging weight of the tubes and lens. 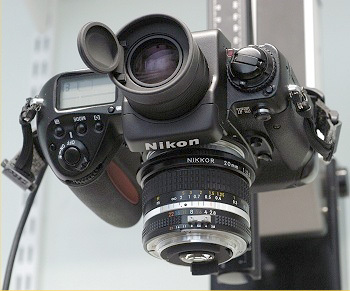 The commonly used Nikon bellows are the PB-4 and PB-6 units. The Nikon PB-6 Bellows permit fully supported extensions up to 208mm for reproduction ratios to nearly 11:1. Or in excess of 400mm if the PB-6E Bellows Extension is attached, for magnifications up to 22:1. The Nikon PB-4 Bellows also incorporates a tilt and shift mechanism on the front extension column, which can be very handy for “squeezing-out” a few more millimeters of depth of field from the lens! Mounting of a camera body onto the bellows can be tricky and damaging to the camera mount if done incorrectly. One important step to do is to make sure that the red lens alignment indicator is at the 9 o’clock position (see animation below). This will allow the camera body to be mounted in the vertical or portrait orientation. Please note that the body cannot be mounted in the horizontal or landscape orientation unless the mounting column is all the way back. If the mounting column is anywhere within the rail length, any attempt to mount the camera body in the horizontal orientation can result in damage to the camera mount. 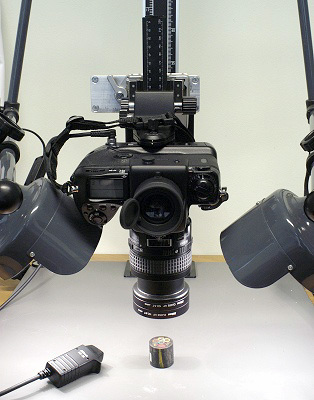 Once the camera body is mounted vertically onto the bellows, the body can be rotated into the horizontal or landscape position by releasing the spring catch on the right side of the camera mounting panel, as shown in the animation below. MF bodies can be mounted directly onto the bellows. If however an AF body is used, the PK-11a 8mm extension tube is required as interface between the bellows and the AF body. This ensures no damage is done to the AF body’s electrical/electronic contacts at the top of the mount. 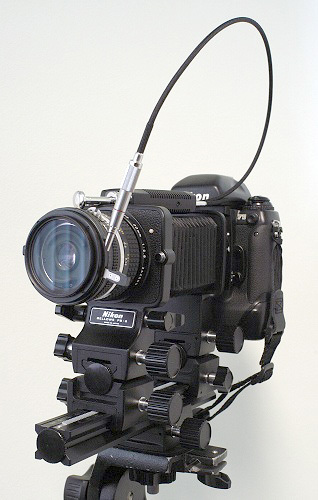 Normal profiled camera bodies, can be mounted to the bellows and be used for both horizontal and vertical format shots. However, larger profile bodies such as the F5 or D1 series and bodies with external battery pack/power grips, a pair of PB-6D Bellows Spacers must be used to increase the height between the bellows standard and rail. 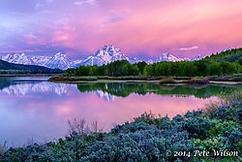 This will then allow for additional clearance to enable the larger motorized bodies to work with the bellows system in landscape and portrait formats. Shown at right a large profile body with PK-11A Extension Tube & PB-6D Spacers as required for bellows mounting. When a lens is normally mounted on to the bellows, aperture control is only available through the lens aperture ring. 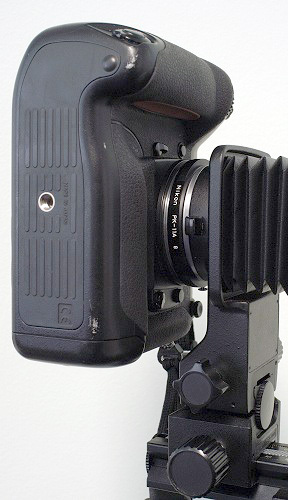 There are no electronic contacts on the bellows to facilitate camera body aperture controls. During shutter triggering, automatic aperture stop-down will only function if the AR-7 (two ISO thread mechanical plungers) or AR-10 (one ISO thread mechanical plunger and one 2-pin electronic connector) double cable releases are used. With either one of the double cable releases, one of the ISO thread mechanical plunger must be screwed into the bellow’s front column where the lens is mounted and the second cable (mechanical or electronic) will be connected to the camera body’s normal cable release port. When using the 2-pin electronic connector on the F5, F100, F/N90(x) and D1-series bodies, a MC-25 adapter cord is required to convert the 2-pin connector into a 10-pin connector, as shown at right. Unfortunately, no infrared double release combinations exist for bodies such as the F/N65. With the plunger-assist automatic aperture control lever activated, the bellows work just like a normal camera body with the little aperture control lever on the lens mount holding the aperture blades wide open. This lever is release only when the shutter is triggered, activating the mechanical plunger on the bellows column to automatically stop-down the aperture blades to the pre-set aperture settings. 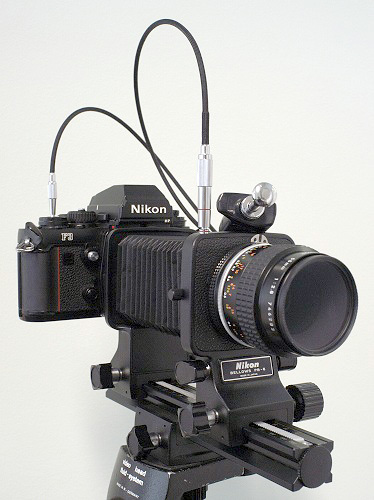 At right, F3HP on the PB-6 with a MF 55mm f/2.8 AI-S Micro-Nikkor triggered from an AR-7 Double Cable Release. Using the auto aperture control activation lever, which also doubles-up as a DoF preview button, the depth of field checked before triggering the shutter. Image at right: F5 on the PB-6 & PB-6D Spacers with a MF 55mm f/2.8 AI-S Micro-Nikkor triggered from an AR-10 Mechanical & Electronic Double Cable Release. If only one single cable release is available for the camera body only, the aperture control on the bellow’s column must be disengaged by means of the manual lock provided on it. Nikon PB-6 Bellows. Animation shows DOF Preview Lock. In such a situation, the aperture should be left wide open (i.e. smallest available f/stop number) during focusing and composition to allow the brightest possible view through the viewfinder. The aperture should then be stopped-down to the desired f/stop number prior the taking the shot. Although this may seem a tedious procedure, the benefit of it when using such a set-up with only one cable is that the lens-mounted half on the bellows is isolated from the body. This reduces the possibility of accidental movement or "shake" of the lens section on the bellows via the cable release plunger. To reverse-mount a lens onto the bellows, the same previously mentioned BR-2A Lens Reversing Ring is used (with the BR-5 step-down ring when necessary). When the lens is reverse-mounted, auto stop-down aperture control can be achieved with the aid of the BR-6 Auto-Diaphragm Adapter which incorporates a plunger-type cable release connector to accept the mechanical cable release from either the AR-7 or AR-10 double cable release. This BR-6 adapter can be omitted if, as in the previous case, only one single cable release to the camera body is available. To attach filters or hoods on the reverse side of the lens, the shown above BR-3 adapter is required. This allows standard 52mm filters or screw-in hoods to be attached to the adapter. In the course of my usage of the bellows, I’ve found that using the double cable release on the bellow’s front column introduces the risk of causing unnecessary extra vibration. This are caused by the mechanical plunger activating the auto stop-down aperture control on both the bellow’s front column or on the BR-6 Adapter. Instead, I completely omit the use of this BR-6 auto-diaphragm ring adapter, replacing it with the BR3 adapter for filter attachments and simply use one single cable release attached to the camera body and manually stop-down the aperture just prior to triggering the shutter (see set-up image below). This eliminates the extra variable of possible vibrations from the lens mount when it comes to the critical review of set-up when the images don’t come out the way they were “supposed” to! 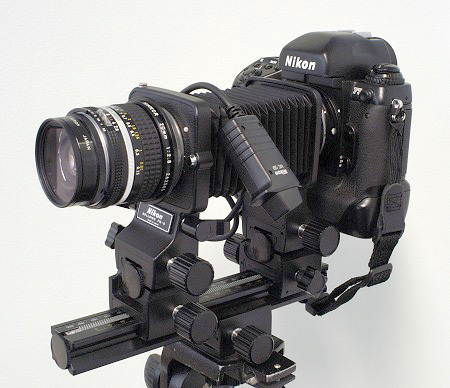 Image: Nikon F5 mounted on PB-6 & PB-6D Spacers with a Reverse-mounted MF 20mm f/2.8 AI-S using the BR2A & BR-5 mounting adapters and the BR3 52mm thread-size attachment adapter. When using the bellows setup for high magnification macro photography, one of the most useful charts to have handy is the scaling chart below. Scales for determining the Magnification or Reproduction Ratio. This chart allows the user to determine the magnification or reproduction ratio directly through the camera viewfinder view. When using any Nikon body other than the F, F2, F3, F4 and F5, the magnification ratio obtained from the chart must be multiplied by a factor of 0.9 to correct for the smaller viewfinders. Only the Pro-series F bodies have a full 100% viewfinder. One of the many luxuries the Nikon Pro bodies provide, namely the Nikon F, F2, F3, F4 & F5, is their ability to change the entire viewfinder assembly to specific finders that are especially suited for close-up and macro photography. Assortment of viewfinders available to the Pro F bodies. Left: F3 with DE-3 High-Eyepoint, DW-3 Waist-level (on camera) & DW-4 6x Magnifying Finders. Right: F5 with DP-30 High-Eyepoint, DW-30 Waist-level & DW-31 6x Magnifying (on camera) Finders. Center: DR-4 Right-Angle Finder. For the rest of the Nikon bodies, both AF and MF, there are the various right-angle finders, such as the DR-3 or DR-4 Right-Angle Finders, that will attach to the viewfinder eyepieces (Note: some bodies may require additional adapters). If one simply requires straight-through magnification of the viewfinder view, there is also the DG-2 2x Magnifying Finder that will fit onto the eyepieces. Left to right: DR-4 Right-Angle Finder, DG-2 2x Magnifying Finder, DR-3 Right-Angle Finder. 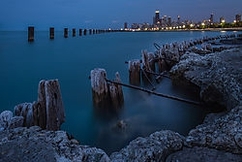 In addition to the camera, lens and various attachments, it is normally advisable to use a fairly sturdy tripod and a cable release for off-camera shutter triggering wherever possible. Sturdy tripod and cable release for close-up photography. 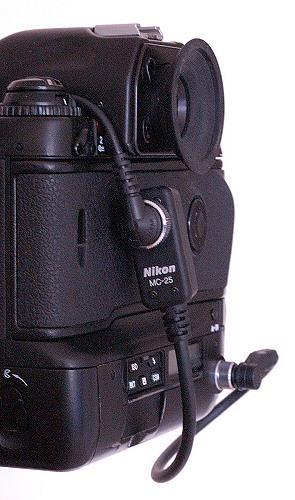 Some camera bodies, such as the F/N80, D100, F3 and older manual bodies, require the mechanical cable release and sometimes additional attachments (i.e. F2 bodies) whilst others, such as the F/N90x, F100, F5, D1(x/H), etc…, require the electrical/electronic 2-pin or 10-pin cable releases. There are a few newer bodies, such as the F/N65 and F/N75, that will only work with a infrared remote control unit. Another option to the cable release (if you do not have one or forgot to bring it along to your shoot) is to use the camera’s built-in self-timer instead. The whole purpose of the off-camera triggering is to minimize accidental camera-shake when tripping the shutter. If however you were handholding the camera, it would be advisable to use the fastest possible shutter speed allowable as well as proper breathing and shutter-release techniques to reduce the amount of camera-shake during the shot. One of the most important things in macro photography is to understand the concept of depth of field and how it is controlled by the aperture of the lens. 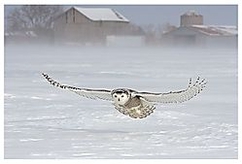 Many photographers are aware of the one-third/two-thirds foreground/background rule of thumb when taking pictures. However, this rule is not valid when the subject being photographed is very close to the lens. In the case of macro photography, this distance can sometimes be just mere centimeters in front of the lens! In macro photography, the near field (foreground) and far field (background) distances are in the order of half and half. That is to say, the two distances are approximately equal. Now, some people may ask, “Why all this fuss about the depth of field, near field, far field terms when all I want is to simply take a picture close up!” The set of images shown above give the best explanation as to how critical the effect of controlling the depth of field can be to the final image. Note the gradual focused effect in both the background and foreground as the aperture is stopped-down from f/5 to f/64, and all this was done without re-adjusting the focusing ring! Suffice to say, there are no hard and fast rules as to what apertures must be used for specific situations. It is more the case of knowing how the aperture will affect the final image and deciding on what sort of effects, including sharpness, best suit the composition (this is of course dictated by YOU, the photographer!). 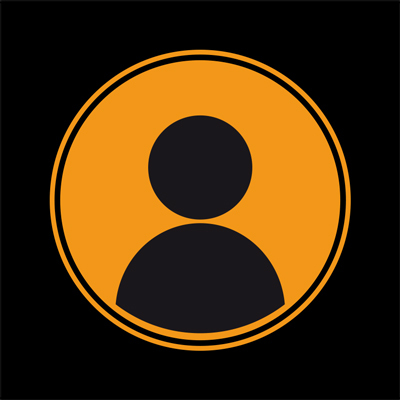 We felt important to make a point about the high caliber professionals in diverse disciplines the community has been able to attract to The Team. We are very proud of them. The author of this article, known by many Nikonians as Szen (username: SzennyBoy), is Chuon-Szen Ong, a mechanical engineer by profession who works in the offshore oil & gas industry as a resident senior consulting engineer, specialized in sub-sea systems design and manufacture. On the flip side of that coin, he is also heavily involved with the necessarily thorough investigations when these sub-sea systems fail. 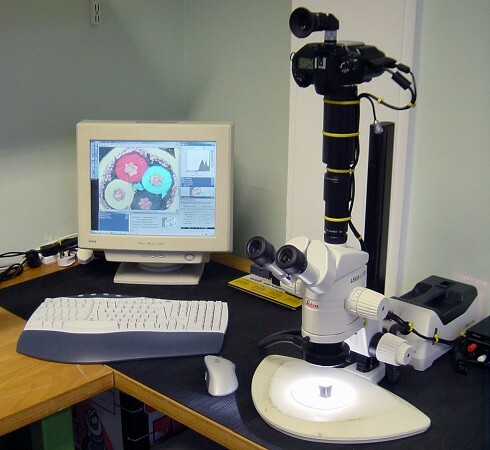 As part of these failure investigations, detailed forensic examinations are conducted on failed components and depending on the requirements, among others, a variety of photographic techniques are used - close-up or macro photography and even photomicrography - that he loves to perform himself. His interest in close-up and macro photography started off just like for many of us, in his "younger days", with just flowers and the everyday objects found all around. It was only during "the days" (long years) in the university, whilst simultaneously working as Research Assistant and for his doctorate in mechanical engineering, that his passion for photography, close-up and macro photography to be more precise, came into its element when the author had to record and document various interesting and original research experimental works. It was also at this stage that he was introduced to the "finer" (more complicated) techniques of macro photography and photomicrography. These experiences have lead to an in-depth appreciation of the complexities involved with close-up and macro photography and an enhanced passion for it. 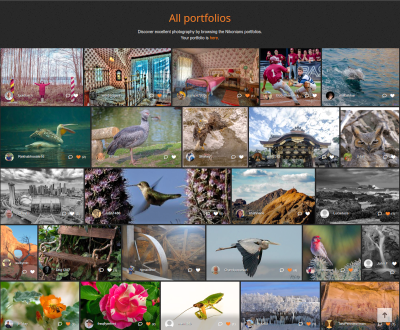 Szen has achieved his Licentiate distinction with the Royal Photographic Society of the UK, where he resides. 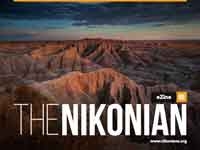 In the Nikonians spirit, it is the author's intent to share some of his knowledge with fellow members through this introductory article. It is our pleasure to have him as a former member of the team and a friend.